The aim of Social Saturday 2015 is to raise awareness of just how easy it is to support social enterprises - businesses that put people and planet first, and use your spending power to make a positive difference to the world we live in. The aim of Social Saturday 2015 is to raise awareness of just how easy it is to support businesses that trade quality items and services and invest profits in projects supporting the local community, international development, the environment, charities and a wealth of other progressive schemes. Social enterprises operate in and support a vast array of sectors. With over 70,000 businesses in the UK alone trading for people and the planet - from print shops to chocolate, energy companies to beer, healthcare providers to baby clothes and housing to pants – the reach of our growing movement is undeniable. Click here for examples. Following the immense success of last year's inaugural Social Saturday, this year, on 10th October we anticipate Social Saturday 2015 to be a true testament to the strength and influence of the social enterprise movement. We will achieve this by creating a more physical presence throughout the UK, so that the general public can identify social enterprises operating in their area and buy the products and services they provide. If you are a consumer, then consume! To visit our buy social directory click here and choose what project to support with your purchase. Don’t stop there – the fun has only begun! Tweet about your purchase, post on Instagram and pin on Pinterest with #socialsaturday2015 to spread the message. Last year our twitterati supporters included Jamie Oliver, 10 Downing Street and Tesco. We’d love to see what you’ve bought and who it’s helped! Take a look at our Social Saturday map and visit these fantastic organisations in person to hear first-hand about how your purchase will make a real difference. If you are a social enterprise, or business you can still consume! Here at SEUK our printing, graphics, office cleaning, water, event management, catering, promotional items and venue hire are all provided by social enterprises. See our Buy Social Guide for more inspiration. Social Saturday is led by the national campaigning body, Social Enterprise UK, and is supported by the Cabinet Office. The day has cross party political support and is part of the UK's successful Buy Socialcampaign. The Buy Social campaign aims to get more people buying from social enterprises. Following successful two year campaign to get more businesses trading with social enterprises, Buy Social is now calling on consumers to get involved. Find out more about the Buy Social campaign. 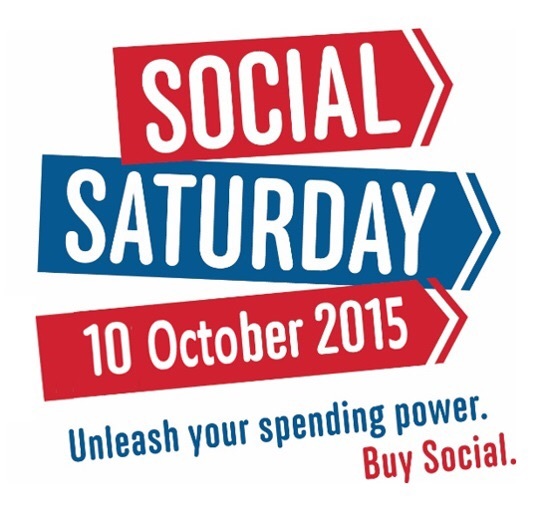 Buying socially is such an obvious thing to do, why do we need the Social Saturday campaign? The 2013 State of Social Enterprise Survey showed that social enterprises primarily trade with the general public and whilst three quarters of the public support the idea of social enterprise, awareness remains low. Social Saturday was launched in 2014 to help the general public to celebrate and buy from social enterprises, businesses that trade for people and planet. On the day, people across the country hit the high street or went online to use their spending power for good and buy from social enterprises. The day was a huge success, with PM David Cameron writing to the Financial Times in support of social enterprises, Big Issue vendors taking our message to the streets in the run up, celebrities including Jamie Oliver and Freema Agyeman voicing their support on Twitter, and national media coverage in the Daily Telegraph, Guardian and Which?. This year we want Social Saturday 2015 to be even bigger.